This second card was designed for the Blooms and Butterflies Color Challenge using only Early Espresso, Strawberry Slush or Regal Rose and White Card stock and ink. To view the rest of the design teams cards Click Here! Misc: Stamp-a-ma-jig #101049, Whisper White Craft Ink #101731. On this card I have to give credit to my daughter Hailey for creating this one. I was in the middle of creating my other card when she came home and loved the colors and wanted to give it try. I think it turned out beautiful! Great job sweetheart. Cut early espresso cardstock to 5 1/2 x 4 1/4, fold in half. Grab your markers, ready set color your image in whatever you like. Stamp the image 3 times. If you want to have them look like the same instead of lighter or darker re-apply the marker ink in between stamping the 2nd and 3rd time. Then clean off image and re-apply marker ink to image again, rotating the color combo and stamp another 3 times, again re-apply marker ink in between each time you stamp the image. Clean off image and then rotate colors again and stamp the last set of 3 images and re-apply marker ink in between each stamped image. Cut out each of the images or you could use a large square punch as long as it covers your image and adhere to whisper white cardstock. Note when adhering if you want some of them to pop out using stampin’ dimensionals do this at this time. In this card she popped out the first image on the first row in the corner and then the second one in the second row and the third one in the last row. It gave it a cute diagonal look by doing this. Once you have the images placed on the white cardstock she cut them out in rows (3 images each row) so that it ended up like a zig zag cut. Attach the 3 rows with snail onto the early espresso cardstock. Finished with a white bow and stamped the word thanks at the bottom, using the stamp-a-ma-jig for placement. This card was designed for the Blooms and Butterflies Color Challenge using only Early Espresso, Strawberry Slush or Regal Rose and White card stock and ink. To View the rest of the design teams cards Click Here! Punches: Hexagon #130919 or see above note. Directions: The card base is cut at 5 1/2 x 4 1/4 in Whisper White, Early Espresso paper cut at 5 1/4 x 4. 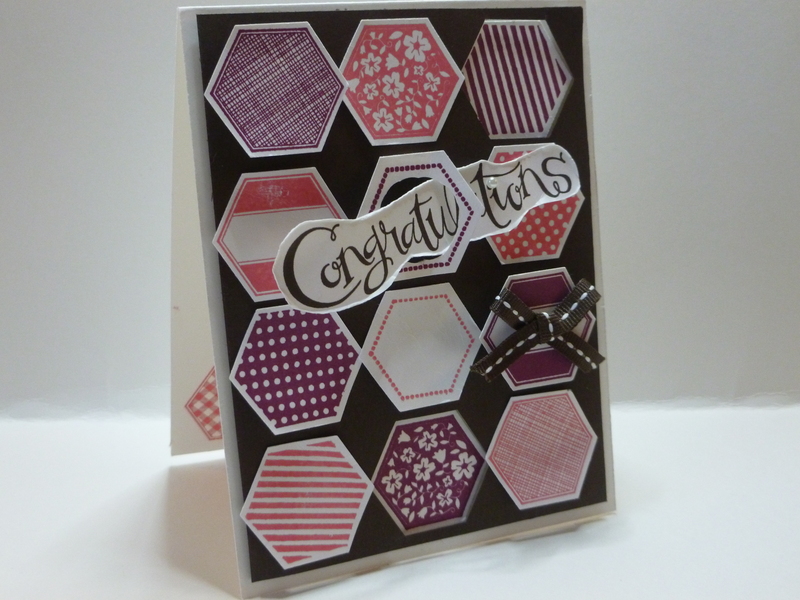 Stamp the Six-Sided Sampler in Rich Razzleberry and Strawberry Slush or Regal Rose on to Whisper White cardstock, then punch from out using the hexagon punch. Here’s where the fun begins. I decided when making the card that I would pop some out, and sink some in. For example on the top row the first one is popped out, the second one is adhered with regular snail and the third one I punched the early espresso cardstock and then used snail to affix the image underneath. Continue doing the other rows as you like. I also cut out part of the open image to feed through the congratulations word through it. The congratulations was stamp on Whisper white with Early espresso ink and I trimmed around the edge and distressed it. I finished it with a Pearl and tied a bow using the early espresso ribbon and affixed to the one of the images. 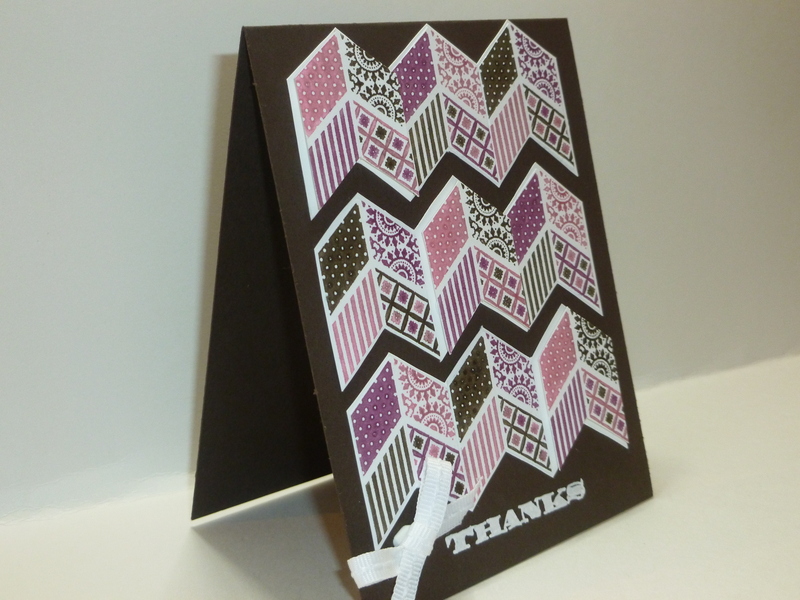 The content in this blog is the sole responsibility of me as an independent Stampin' Up! demonstrator and the use of content of classes, services or products offered is not endorsed by Stampin' Up!